The UWI has always made contributions to the development of the Region through research and innovation. CFST is an opportunity for researchers from a broad range of disciplines across Science, Technology, Engineering and Mathematics (STEM) to showcase their work and the associated relevance to future development. The 2018 conference will feature oral and poster presentations of original work, plenary speakers from industrial and academic backgrounds and an internationally recognized keynote speaker. The UWI celebrates its 70th anniversary in 2018. The Faculty of Science and Technology Conference 2018 is an opportunity for the Faculty to highlight the contributions of scientific research and application to regional development. In particular, FST Conference 2018 will emphasize the impact of research that addresses national, regional and international societal challenges on the Caribbean region and beyond. The conference will feature oral and poster presentations of original work, plenary speakers from industry and academia and internationally recognized keynotes. Awards will be given for best presentations by undergraduate and postgraduate students. One of the highlights of the conference will be a Grand Challenge Competition that will involve student teams vying to design solutions to specific national and commercial challenges that have been identified. The top teams will receive special prizes. We invite original submissions for oral or poster presentations. A call for interactive demonstrations and the Grand Challenge Competition will be circulated later. Abstracts will be peer reviewed and included in the conference proceedings. To register as an author or attendee, please click on the "Accounts" link. The UWI has always made contributions to the development of the Region through science, technology, engineering and mathematics (STEM). FST Conference 2015 is an opportunity for researchers from a broad range of disciplines across the STEM to showcase their work and the associated relevance to future development. We invite original submissions for oral or poster presentations. For further details, including details on formatting of abstracts and full papers, as well as submission instructions, please see the conference website: http://ocs.mona.uwi.edu/index.php/fpas/fst2015. The UWI has always made contributions to the development of the Region through research and innovation. FPAS Conf 2012 is an opportunity for researchers from a broad range of disciplines across the Pure and Applied Sciences to showcase their work and the associated relevance to future development. The conference will feature oral and poster presentations of original work, plenary speakers from industrial and academic backgrounds and an internationally recognised key-note speaker. Awards will be given for best presentations by students. The Caribbean Child Research Conference is a regional event, covering a range of child related themes. The conference aims to share research on children, strengthen the network of researchers on children issues, and encourage research in areas that are often “under-researched.” The conference presents an opportunity for children and adults to examine the status of children and child rights in the Caribbean. The Caribbean conference is however not simply about children - it also facilitates the meaningful participation of children. Children participate by attendance at the conference and presentation on the children’s panels. The annual Caribbean Child Research Conference is held in Jamaica; it is a regional interdisciplinary conference covering a range of child related themes. The conference aims to share research on children, strengthen the network of researchers on children's issues, and encourage research in areas that are often "under-researched". The 11th annual Caribbean Child Research Conference is weeks away! We invite you to support this worthy cause by sponsoring a child's attendance through our GoFundMe page at https://www.gofundme.com/CCRC2016. The deadline for submission of abstracts has been extended to September 20. Due to the severe weather threatening Jamaica, a decision has been taken to postpone the Caribbean Child Research Conference 2012 scheduled for October 24-25, 2012 to November 6-7, 2012 at Jamaica Conference Centre. We want to ensure the safety of local and overseas participants. We regret any inconvenience caused and look forward to seeing you at the conference on November 6-7, 2012. Come and listen to our children and adult researchers discuss issues that affect our children. The annual Caribbean Child Research Conference is held in Jamaica (in October); it is a regional interdisciplinary conference covering a range of child related themes. The conference aims to share research on children, strengthen the network of researchers on children's issues, and encourage research in areas that are often "under-researched". The Meeting is intended to cover all aspects of Amphizoic Free-living Amoebae with pathogenic potential to humans and animals. Scientists, students and people who are concerned with all aspects of the biology and pathogenicity, as well as related research fields of free-living amoebae, are cordially invited to attend the meeting. With all our hearts, we welcome you to Jamaica and hope that you enjoy the research communications as well as our Jamaican culture and kindness. It will also be our great pleasure if the meeting gives opportunities to see members whose faces are familiar from earlier meetings as well as to make acquaintance of the newcomers. We are looking forward to seeing you soon, in Jamaica. The UWI will be organizing XIVth International Meeting on the Biology and Pathogenicity of Free Living Amoebae (called FLAM 2011) in Montego Bay at the Iberostar from 10th-15th October 2011. Abstracts should not be longer than 1 page (word) and must include FULL NAME of all authors and also the name of the presenting author should be underlined. The deadline for abstracts submissions is the 30th of July 2011. You must have an account to submit an abstract Click here if you do not have an account. Those authors applying for the student or young researcher grant please also indicate it during submission. The Centre for Caribbean Thought (CCT) UWI, Mona, in association with Africana Studies at Brown University and the Institute of Caribbean Studies, University of Puerto Rico, Rio Piedras is proud to host the VIIth Caribbean Reasonings Conference entitled Freedom and Power in the Caribbean: the Work of Gordon K. Lewis. The conference, which was postponed from its original dates, due to the state of emergency in Kingston, will be held from September 30 - October 2 at the University of the West Indies, Mona. Professor Gordon K. Lewis, (1919 – 1991) taught for many years at the University of Puerto Rico and wrote path-breaking books on the Caribbean’s history, politics and intellectual development. Texts such as Puerto Rico: Freedom and Power in the Caribbean (1963), The Growth of the Modern West Indies (1968), and Main Currents in Caribbean Thought: the historical evolution of Caribbean society in its ideological aspects (1983), exemplify the breadth of his interests as well as the range and quality of his output. Lewis’ work transcended the region’s linguistic fragmentation and was consistent with the view that “No one could really claim to be a full practitioner in Caribbean Studies until he came to write ultimately, on the Caribbean as a whole.” (Main Currents in Caribbean Thought, (1983) Maingot, introduction vi). This conference in 2010 will reopen inter-territorial networks to enable studies across language barriers, a goal the Centre for Caribbean Thought has articulated and continues to realize since 2001 through several conferences and the “Caribbean Reasonings” book series with Ian Randle Publishers. It will also seek to introduce the seminal work of Gordon K. Lewis to a new generation of young scholars, interested in moving beyond constricting national barriers, in order to study the region in its entirety. The conference will be held at the UWI, Mona Campus. The Hon. Ralph Gonsalves, PM of St Vincent and the Grenadines, will be the opening speaker. Conference programme includes the launch of the latest book in the Caribbean Reasonings Series - The Thought of New World: The Quest for Decolonisation, as well as Gordon K. Lewis' most recent book - On Race, Class and Ideology in the Caribbean, edited and with an introduction from Professor Anthony Maingot. Professor Franklin Knight will speak to the opening of an exhibition on the life and work of G.K. Lewis, as well as the launch of the books. The guest speaker for the closing ceremony is Professor Sir Hilary Beckles, Principal of the UWI, Cave Hill, Barbados. The conference theme, REGIONAL CHALLENGES - the energy perspective, adversities versus opportunities, will provide the framework to address the main energy, economic and environment concerns across the region. The CEEE 2011 conference will be the forum for academia and industry to sought practical solutions to the concerns for a sustainable future, according to the technical, environmental, financial, and regulatory and policy framework. These have become the core areas to be addressed periodically based on the dynamics of the global challenges. The University of the West Indies (UWI), Mona Campus, recognizes the need for extensive research in order to guide the development of the energy resources indigenous to the Caribbean region and their use thereafter. With this in mind, UWI will be putting on the premier Caribbean energy conference: "Caribbean Energy, Environment and the Economy 2011 ".The conference theme, REGIONAL CHALLENGES - the energy perspective, adversities versus opportunities, will provide the framework to address the main energy, economic and environment concerns across the region. The research conference is a medium for exchange of current research regarding nursing. This onference is held bi-annually at the UWI School of Nursing. 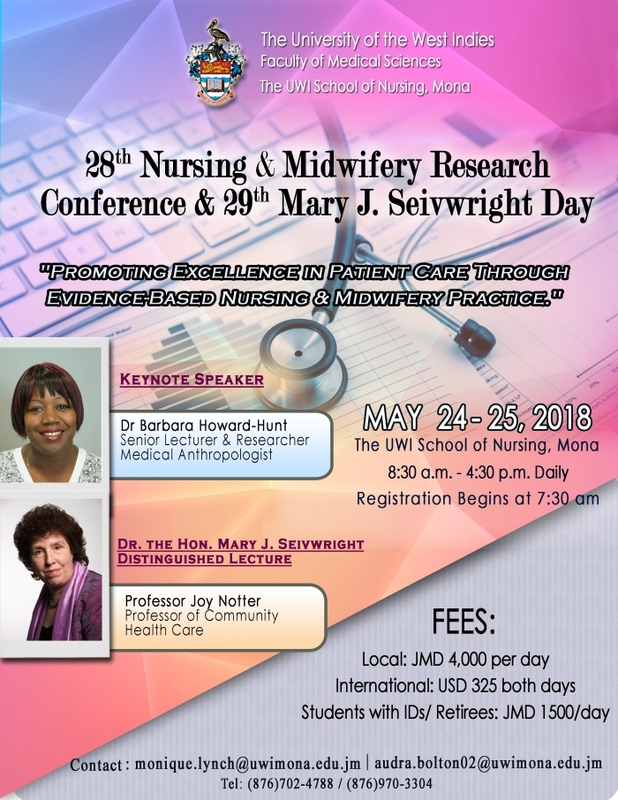 The UWI School of Nursing, Mona cordially invites you to the hosting of its 28th Annual Nursing and Midwifery Research Conference and 29th Mary J. Seivwright Day on May 24-25, 2018, under the theme: Promoting excellence in patient care through Evidence-Based Nursing & Midwifery Practice. The Conference will be held at The UWI School of Nursing, Mona Campus. Both international and national nursing organizations emphasize “Evidence Based Practice” as the standard for nursing practice. According to the International Council of Nurses (ICN), closing the gap between evidence and action requires stronger emphasis to be placed on implementing strategies to translate knowledge to action. Implementing best practice guidelines is one of the key strategies for integrating the best available research evidence into nursing practice thereby enhancing the quality of patient care. The World Health Organization (WHO) People Centred Care Policy Framework emphasises health systems that meet the needs and expectations of people seeking health care. In keeping with this goal, member states of WHO have developed National Policies that promote people centred health care by ensuring that people have access to sustainable, responsive and effective health care systems. Within this framework, nurses and other health care workers are expected to provide high quality health care that is responsive to multidimensional needs of individuals, families and communities. Nurses, being primary health care givers at the frontline of healthcare systems are expected to ensure a holistic people centred approach to providing nursing care. Provide a forum for engagement and networking among nursing and midwifery scholars to facilitate collaborative nursing and midwifery research. Nurses are the backbone of public health care systems both regionally and internationally. According to the 2006 Report of the Caribbean Commission on Health and Development, nursing personnel account for up to 70% of health care staffing and provide the majority of direct patient care in the Caribbean. Providing quality health care is key to reducing healthcare costs and improving the quality of life of the population. For that reason, the involvement of nurses and midwives in producing and using research evidence is critical in advancing evidence-based nursing and midwifery practice, the development and implementation of healthy public policy as well as effective and functional health care systems. Excellence in patient care is dependent on the availability of sound evidence that is based on clinical relevant research, conducted using robust methodologies. Evidence based nursing practice requires the integration of the individual nurse’s clinical expertise, patients’ values and preferences and the best available research evidence into decisions on patient care. To implement evidence based practice nurses must possess skills in identifying relevant resources, conducting systematic search of literature, appraising the evidence for its validity and applicability, integrating evidence into clinical practice and evaluating patient outcomes. With much national and regional attention focused on nursing-related issues such as nurse migration, staff shortages, education and the transition to tertiary level institutions and the quality of nursing care, it is essential that nursing research is conducted to inform healthcare delivery and policy. Nursing academics and clinical nurses in the Caribbean, who wish to participate in research, are often faced with a number of constraints including high workloads, poor research skills and knowledge and few experienced nurse researchers to act as mentors. These limitations are further compounded by limited funding for nursing research and the power differentials among health disciplines. Utilizing a community framework to develop nursing research capacity that includes nurses in academia, clinical practice, and management will allow individuals to share expertise, pool resources and produce research that is of local, regional and international relevance. The capacity to generate good quality research is integral to the development of health systems in lower and middle income countries (LMICs). Nurses who form the largest part of the health care workforce must be supported to engage in research, including interdisciplinary research, if LMICs are to produce relevant evidence to guide health systems development. Explore facilitating mechanisms and resources that promote the building and sustaining of research capacity. Enable dialogue among nurse researchers, nurse educators, clinical leaders, and health policy makers on the development of nursing research to improve health and healthcare delivery. Contemporary approaches to nursing education requires programmes to be evidenced based and delivered by nursing educators who are educated to a level appropriate to their role. Traditional approaches to nursing education needs to be replaced by new models that are able to address the severe shortage of nurses in the Caribbean and provide nurses with the necessary competencies to practice safely in a changing healthcare environment. Nursing education must be designed to enable students to effectively integrate theoretical and clinical knowledge and to gain practice experience in a range of facilities beyond the hospital setting. The purpose of this conference is to enable nursing lecturers, tutors, nurse managers, preceptors, clinical staff, students, policy makers and nursing regulators across the Caribbean region to explore international evidence on innovative approaches to nursing education in the classroom and clinical areas. The programme will focus on shared research and best practice within the global nurse education community and enable networking and collaboration for future research. Contemporary approaches to nursing education requires programmes to be evidenced based and delivered by nursing educators who are educated to a level appropriate to their role. Traditional approaches to nursing education needs to be replaced by new models that are able to address the severe shortage of nurses in the Caribbean and provide nurses with the necessary competencies to practice safely in a changing healthcare environment. Nursing education must be designed to enable students to effectively integrate theoretical and clinical knowledge and to gain practice experience in a range of facilities beyond the hospital setting. 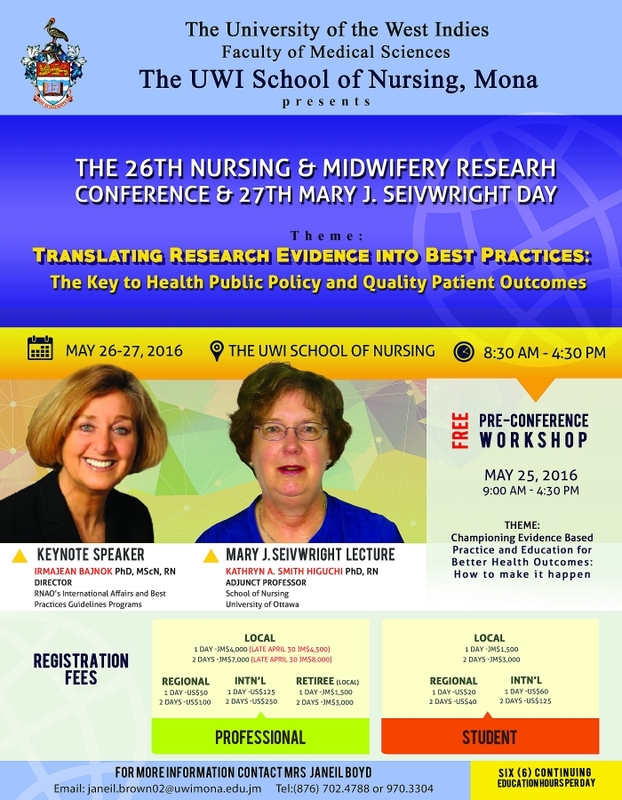 Therefore the UWI School of Nursing in collaboration with the Jamaica Midwives Association is hosting The Annual Nursing and Midwifery Research Conference and Mary J Seivwright Research Day on May 26- 27, 2011 focusing on "Transforming Nursing Education in the Caribbean." 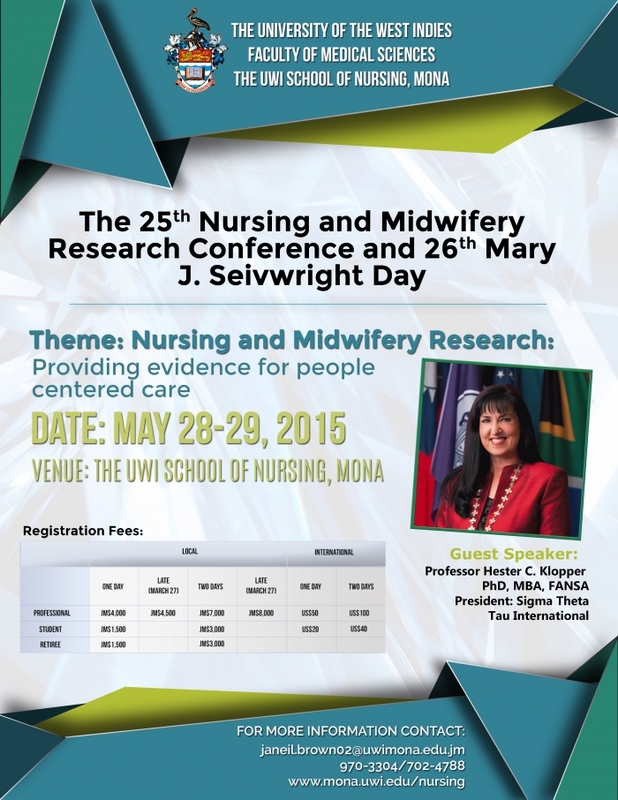 The Conference will be held on 26- 27 May 2011 at the UWI School of Nursing in Kingston, Jamaica. A Dinner will be on the evening of the 26th at the UWISON Courtyard, Mary J. Seivwright Buliding, 9 Gilbraltar Camp Way, UWI, Mona Campus starting at 7:00pm. 5th IUPAC-Sponsored International Symposium on Macro- and Supramolecular Architectures and Materials: New Science and Technologies for the Improvement of Human Living Standards. New Science and Technologies for the Improvement of Human Living Standards. The Mona School of Business Roundtable Forum is designed to present vital issues to major private sector leaders which are having an impact on business, and which have to be considered in the context of the ongoing and future globalization of business. A workshop exploring barriers, drivers and unused potential of sustainable energy systems. UWI hosts the International Network on Energy and Environmental Sustainability (INEES) kick-off Workshop on Barriers, Drivers and Unused Potentials Related to Sustainable Energy Systems. The workshop will be held in Jamaica from 29/11/2009 to 04/12/2009. As Jamaica proudly celebrates her fiftieth jubilee of political independence, the Rastafari Movement also marks the fiftieth anniversary of Coral Gardens Massacre, an event that still haunts the wider society through the perennial, but unanswered, Rastafari calls for justice. The new nation-state less than one year old - during the Easter Holy Week, became embroiled in a series of violent events in the Coral Gardens and Rose Hall areas of St. James. On Holy Thursday April 11, 1963, six bearded men assumed to be Rastafarians attacked a gas station in Coral Gardens. They were reportedly armed with guns and machetes. This resulted in a skirmish and the death of two policemen, and six civilians including three of the assailants. "Commemorating the 50th Anniversary of the Coral Gardens Massacre"
2010 will mark 50 years since the “Report on The Rastafari Movement in Kingston, Jamaica” was first published by the then University College of the West Indies. This Report authored by M.G. Smith, Roy Augier and Rex Nettleford validated the University’s sense of its social responsibility and remains one of its most successful monographs, having gone through eight reproductions without change in form or content, on its way to becoming a most highly referenced document on the Movement. 2010 also marks the 80th anniversary of the Rastafari Movement itself, which has grown from a few visionaries struck by the coronation of the Ethiopian Emperor Haile Selassie I in November 1930, into a vital force in reconstructing and elevating the African Presence in the Western landscape. In recognition of these two anniversaries and on the birthday of the Pan-African champion and nation’s first National Hero, the Honourable Marcus Mosiah Garvey, the Institute of Caribbean Studies announces the inaugural Rastafari Studies Conference to be held at the Mona Campus of the University of the West Indies August 17 - 20, 2010, under the Chairmanship of Emeritus Professor Sir Roy Augier. The Mona School of Business, University of the West Indies and the Caribbean Internet Forum’s Board of Directors are pleased to invite you to register and participate in the 7th Annual Caribbean Internet Forum to be held in Kingston, Jamaica, November 25-26, 2009. This solutions-oriented two-day conference will be convened under the theme ‘Building a Caribbean Broadband Platform for Regional Development’ and will bring together regional service providers, business leaders, government policy-makers, regulators as well as policy and practice leaders in information and communication technologies, telecommunications, Internet service provision and media. The Organising Committee of TropHort2010 is pleased to announce that the 1st International Symposium on Tropical Horticulture will be held at the Jamaica Pegasus Hotel in Kingston, Jamaica, November 22-26, 2010. This symposium is an opportunity to bring together researchers, technologists, workers, and commercial users interested in tropical crops. The dual aims are to promote information exchange and linkages between specialists, and to foster interchange between those with different scientific emphases in studying tropical crops. This conference is the first Qualitative Inquiry Conference to be held in the Caribbean. It will be hosted by the School of Education at the University of the West Indies, Jamaica. The conference will provide a forum for researchers and practitioners from across all disciplines to share their expertise on qualitative research issues and showcase qualitative research and innovative methods of inquiry. A programme of pre-conference seminars is planned for the afternoon of Thursday October 29, 2009. The conference also features workshops for participants to share their skills and build research capacity. The International Conference on Information Resources Management (Conf-IRM) provides a peer-reviewed forum for researchers from across the globe to share contemporary research on developments in the fields of information systems and information management. It seeks to promote effective and vibrant networking among researchers and practitioners from around the world who are concerned about the effective management of information resources in organizations. This network of researchers views fostering the development of emerging scholars in the information systems and information management fields as its primary task. Consequently the conference is designed to provide a venue for researchers to get substantive and beneficial feedback on their work. Conf-IRM builds on the traditions of the Information Resources Management Association (IRMA) Conferences. Under new leadership, the IRMA Conference has been re-positioned and will now be known as Conf-IRM. Conf-IRM conferences are generally held in the third week of May of each year. The Official Conf-IRM 2010 Website can be viewed at http://www.conf-irm.org/ocs/index.php/conf-irm/2010. The International Telecommunications Society (ITS) is pleased to announce that the 1st Caribbean Regional ITS Conference will be held in Montego Bay, Jamaica, on June 23-26, 2009. The conference will be convened by the Mona School of Business at the University of the West Indies. The conference theme is "Innovation, Demand and Competitiveness in Telecommunications: Implications for the Caribbean Region and Beyond."